An Android tablet brought back from North Korea by a tourist has provided a glimpse at some of the restrictions placed on IT users in the famously secretive country. 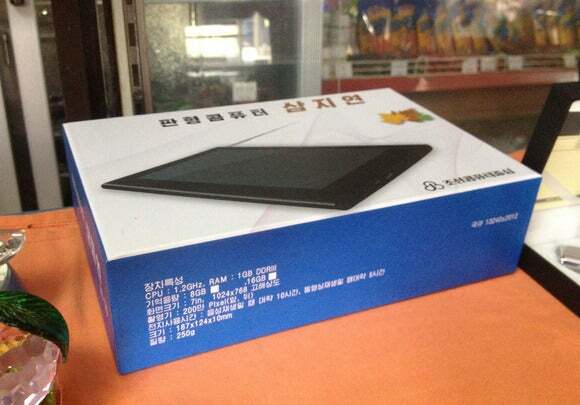 The Samjiyon is the third tablet to have gone on sale in North Korea. It was unveiled at a trade show in the capital, Pyongyang, last September and received some coverage on state television, but few Westerners have had a chance to see it up close. The tablet was likely manufactured outside of North Korea, and the hardware itself is fairly unremarkable, but the software and the usage restrictions placed on the device provide some insights about life in the country. The device has a 7-inch screen with a resolution of 1024 by 768 pixels and runs Android 4.0.4, known as Ice Cream Sandwich. Under the hood is a 1.2GHz processor, 8GB or 16GB of internal storage, depending on the model, and a 2-megapixel camera. The tourist, who provided images and a detailed description of the device to IDG News Service, said he was surprised to find the tablet on sale at a gift shop in a restaurant. The tourist asked that only his first name, Michael, be used, because he wants to avoid any publicity that might complicate return trips to the country. “We had just finished lunch at a hot-pot restaurant in Pyongyang and had time to kill while some of us smoked,” Michael said. He saw the tablet at the gift shop and asked to take a photo. “I asked if it was for sale, as more of a joke than anything, and I was surprised to have the woman behind the counter tell me it was for sale for just $200,” he said. That’s a bit cheaper than Google’s latest Nexus 7 tablet but still way out of reach for most North Koreans, who earn on average less than $100 per month. Tablets are a luxury device there. The Samjiyon is “surprisingly impressive” to use, said Michael, who uses several Android tablets in his job. The tablet was almost certainly manufactured outside of North Korea by an Asian contract manufacturer. North Korea’s high-tech industry, to the extent it has one, is focused on software, and the country isn’t thought to have any computer hardware manufacturing capability. The version of Android on the device doesn’t include Google services such as YouTube and Gmail, but the other familiar Android icons are there, including the browser, image gallery, calculator, and camera. That’s probably because the Google services would require a license, and in any case the Internet is scarcely available in the country. Instead, there’s a nationwide intranet that has many of the same services, such as email and video streaming, but that’s tightly controlled and doesn’t extend outside the country’s borders. The browser has four bookmarks pre-installed, for the country’s main news agency, its major daily newspaper, a portal run by the Korea Computer Center, and state television. The first three have websites that are accessible on the global Internet, though the addresses stored on the Samjiyon are different, pointing to sites on the country’s intranet. Despite the browser and bookmarks, Michael hasn’t been able to get the Samjiyon online. Configuration files deep in the tablet suggest there is Wi-Fi hardware installed, but there’s no apparent way to activate or control it. The hardware is either not present or has been configured to connect only to certain networks. Among several foreign software packages on the tablet is a Korean version of ‘Angry Birds.’ The game’s maker, Rovio, didn’t respond to requests for comment on its inclusion in a North Korean tablet. There are also several domestic programs. They include a multilingual dictionary, a dictionary of IT terms, a Korean history app, a Korean chess game, and a collection of books for studying “juche,” North Korea’s founding principle of self-reliance. The Samjiyon has been hailed by state media as a useful tool for students, and there are several learning apps. One opens a virtual bookshelf with books on music, computers, mathematics, and revolutionary studies, such as the childhood of Kim Il Sung, the country’s founder. One of the notable features is a TV tuner. It’s compatible with North Korea’s analog TV broadcasting system and comes preset to tune VHF channels 5 and 12, and UHF channels 25 and 31. That will get users two channels in Pyongyang, according to transmitter data from the country. It isn’t possible to retune the channels, probably to prevent users from accessing broadcasts from neighboring China or South Korea, which is forbidden by the government.